So as I posted vaguely on Facebook, a few weeks ago we scored another awesome Ikea "As-Is" deal on the Ikea Liatorp dining table that we had been eyeing. It was marked down to $139, down from $279, which is a great savings! It had a tiny little scratch in the top, which is why it was so cheap. We obviously snatched that baby right up and brought her home. Now don't get me wrong, I loved this little table as she was, but with our new white dishes, it was a whole lotta white on white going on. Booooooring! So I had the idea to paint the top of it with chalboard paint! Last year, we made a Chalkboard paint Parson Desk (that didn't make it through the move, RIP) and we loved it! We loved writing cute notes on it, kids loved playing on it, it was just a barrel of fun. I also loved the charcoal grey almost black color the paint takes on dry. 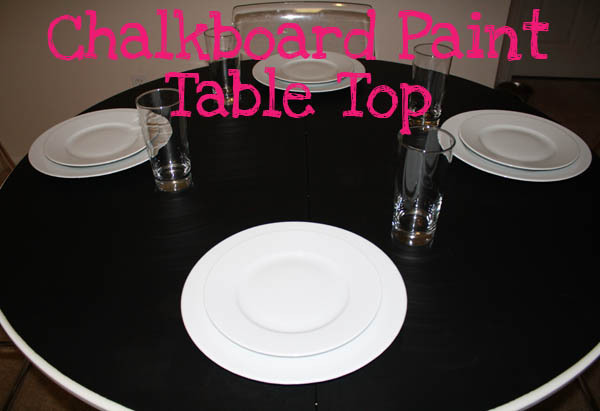 So I decided to take a leap of faith on our little table and paint her top chalboardy. So first I wiped it down clean, to make sure it would go on nice and smooth. Then I taped around the edges. 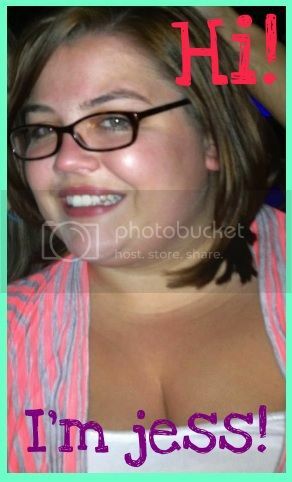 Excuse the gap-toothed-ness. There is a piece that goes there, but we didn't put it on for the painting process. The key to success is thin and even coats. This is after the first coat (it looked sketchy), but after 3 thin and even coats with a foam roller, this is what we got. Look at that baby! Isnt that 1,000 times better than the white on white?!?! So much better! So there you have it! We hadn't tried out the chalk yet when I took these photos, but we have since and we LOVE it! So what did you do for the Pinterest Challenge? Also check out the Homemade Ginger Link party going on! I like! That would be great when you have people over to put their names at each place setting :) Great Idea! That is an awesome idea! I also thought we could keep score from card games right on the table! Looks GREAT! 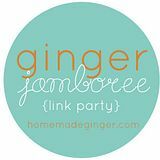 I would LOVE for you to link this up at my Ginger Jamboree Link Party! !